As most people are, we are all on our own individual journey to seek success, happiness, and fun. A lot of the journey involves joyful moments, and a lot of it also involves mistakes and consequences. Goals change and what you once valued maybe a month ago, probably won’t matter much today. There are of course the highs and lows which are all part of life, and there’s also you, the ultimate variable which controls your state of happiness. For me right now, I’m feeling a bit of a lost cause. Just want to be totally honest with you. Feeling generally lost about ‘next steps’ in the direction of what I would like my future to look like or be like. I believe that we create and choose the life we want to live. We don’t just end up somewhere by mistake as it’s the outcome from our decisions in the past that determine our future, whether they may be good or bad. But how do you be happy while living through a ‘consequence’ or an uncontrollable unpleasant moment that you’re trying to dig yourself out of to finally feel free, in control, and happy again? Well, I started reading. Not fiction, but inspirational/motivational/personal developmental self-help kind of books. Books that would give me a different perspective on life in general and to see if something will spring out at me that will give me my ‘a-ha’ moment and I can move on. It didn’t have to matter what it was really about, as long I gained some kind of outside knowledge that would help me in the pursuit of finding myself again and finding my happiness. 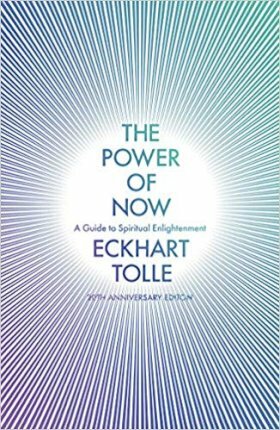 One of the books I am currently in the middle of is called The Power of Now by Eckhart Tolle. Earlier in this post, I briefly spoke about being lost and finding happiness. I also said that I believe it’s a choice; we choose to be happy or not happy. This book, talks about this exact thing that I truly believe inand strategies on HOW to find that happiness within you. There have been many times these past few months where I have felt overwhelmed or underwhelmed, but I’ve recalled certain strategies from this book. ​I had no intention to make this blog post to look like a ‘book review’, but I’m telling you, if you’re looking for something to stop the noise in your head for the slightest moment, this book is for you. I’m still not yet where I want to be in regards to finding my happiness, but what this book has taught me is that it’s OK to feel lost, it’s OK to have these emotions, and you don’t have to react to them or try to fix them. It’s taught me that wanting to be alone and fighting to be alone is important in listening to your body and gaining full consciousness, and that this will help me become better with my decisions. I absolutely believe you can find positivity among the negativity, it’s just a matter of working out the strategy, practicing, and consciously choosing to do this. I’m still yet to finish this book but I absolutely cannot wait to see what else I will learn in regards to unlocking positivity and happiness back in my life for good. I think it’s important you find a book that will give you your ‘a-ha’ moment and I hope it will guide you through your life journey. ​It may not solve all of your problems but you may find something that will get you through another day.